The last day of January was the first day for 55 recruits eager to make their mark with Toronto Police. However, it also was the last day on the job for veteran officers S/Sgt. Steve Pattison and Sgt. Andrew Kis who played huge roles in preparing new recruits at the Toronto Police College. Pattison was in charge of the recruit training and leadership while Kis was an instructor. After a semester in college, Pattison joined the Service. Starting at 33 Division, he worked in Divisional roles including Major Crime and with Special Investigation Services before securing promotion in 2005 and been assigned to 12 Division where he spent a year before going to 22 Division. Promoted to S/Sgt. 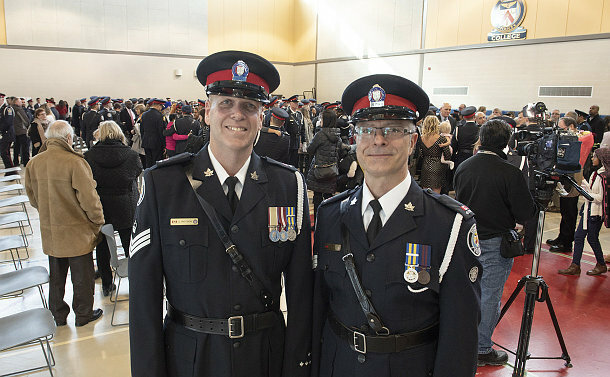 in 2009, Pattison was the executive officer for retired senior officer Jeff McGuire prior to undertaking a police mentoring role in Afghanistan. On his return, he headed staff planning and served as executive officer for Corporate Services director Kristine Kijewski before going to the college in November 2014. He plans to travel and get to work with his hands on home improvement projects. Leaving the Service on graduation day was also pleasing for Kis who joined the Service on February 2, 1982. Kis created a mini-documentary of the recruits training that’s shown at the graduation ceremony. After three years as a cadet working in the Summons Bureau and at headquarters under then Supt. William McCormack, Kis was assigned to One Traffic after graduating. Of his 37 years on the job, a total of 22 was spent at 31 Division.